To kick off another week I have another nail polish to share with you! As I was preparing to paint my nails, I asked you guys on Twitter (@frmheadtotoe) which polish I should use and the most frequently voted choice was OPI Don't Bossa Nova Me Around. Since I wanted a mini break from the summer brights I've been sporting lately, I decided to go for this work-appropriate, classy look. Don't Bossa Nova Me Around is part of OPI's Brazil collection which I was surprised to see considering the rest of the shades from the collection I've tried have been attention-getting brights. I would describe this as a pinky-putty color that gives a clean, "mannequin hands" look which leans more dusty-neutral than pastel. Here I used OPI Nail Envy for the base, just 2 coats of Don't Bossa Nova Me Around for full opacity, and topped it off with Seche Vite Top Coat. Application and wear has been great as per usual with OPI polishes. Overall, if you are a fan of ladylike neutrals and want to try something on the lighter end of the spectrum versus reds, burgundies, and taupes, definitely consider trying Don't Bossa Nova Me Around. It's an unusual classic that's very easy to wear and will give your hands a longer look. I can also imagine jazzing it up with some graphic black like this since it works so well as a neutral base. Readers, what is your favorite "work-appropriate" polish? Do you prefer neutrals or brights on your nails? Let me know in the comments! Wow! 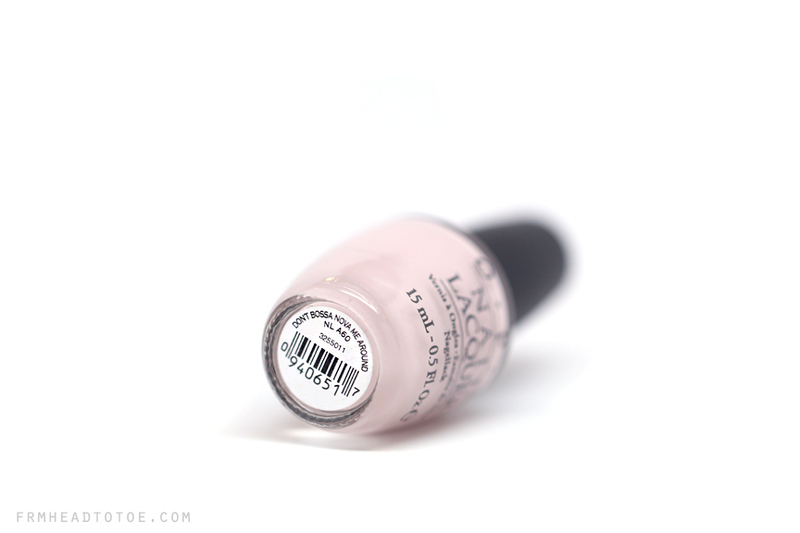 I normally avoid baby pink nail polishes because they make my skin look dull, but this looks like a perfect shade!! This colour is so cute! I don't believe I own rose nail polish so I may just invest in this one. Great neutral colour, I can definitely imagine wearing it for work! I love pinky neutrals.. they are so polished and chic! I love this one.. it looks a lot like Dior Incognito.. which I have. I always worry that pinks/neutrals won't look as flattering on my warm/tan skin. It looks great on you though! For work, I pretty much go with any shade - but for an interview, I just went au naturale with just a base coat! Such a gorgeous colour! I'm obsessed with OPI nail polished and ashamed I don't have this shade! haha. Such a stunning colour!! I need to add this one to my collection!